One of the biggest draws of AMD’s graphics cards is the ability to span across three monitors from one card. The problem though has been that in order to do this, one of the monitors must use a DisplayPort connection. These monitors are not nearly as plentiful or cheap as HDMI and DVI monitors, and adapters can be expensive and troublesome, making Eyefinity a little difficult for the average person. 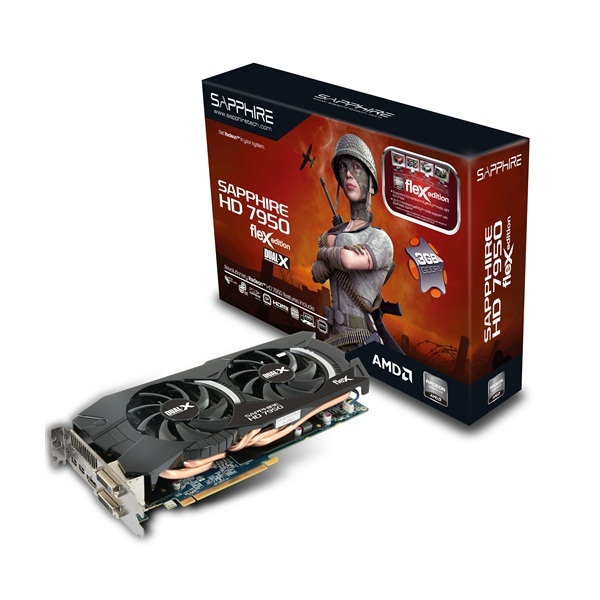 Today we are taking a look at Sapphire’s FleX edition of the 7950. We have seen the Flex before and discussed its advantages over the standard cards. What is special about the FleX cards is that they are able to run three monitors from one card without the need for one of the monitors to support DisplayPort. This makes setting up a three monitor Eyefinity much simpler and will probably save you money as well.